I wanted to showcase some perfect glowing moonstone beads. 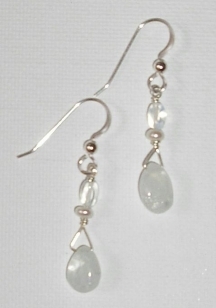 Moonstone is a birthstone for June, so these would make a nice birthday gift. Moonstone has a nice opal-like quality, glowing and reflecting blue and pink light. 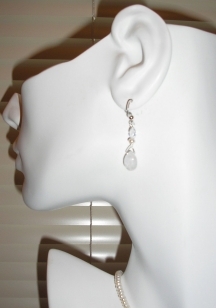 These are made with smooth moonstone briolette teardrop beads, and accented with small white button pearls and opalite. Cut several inches of sterling silver wire. 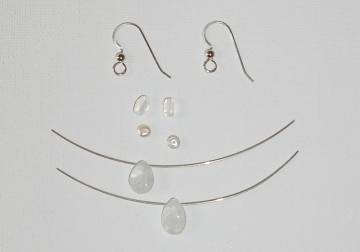 Slide the moonstone briolette bead into the center of the wire. Bend the ends of the wire up to meet in the middle at the top of the bead. Follow my instructions for wire wrapping a briolette to make a closed loop at the top with a stem. We will attach the other beads to this top of the wire stem. Slide the pearl and opalite bead onto the wire, then attach it to the earring component making a closed loop. Use your round nose piers to form a loop, slide it through the earring component, then wrap the wire back down around the stem a few times, creating a secure closed loop. If you need help learning to make a loop, follow these instructions. That's it, your pretty new earrings are ready to wear!